Brood Parasites or Never an Empty Nest? Wheat Rust Responding to Climate Change? Many of us are fortunate to have a tiny piece of the earth’s land surface under our control. What do you want to do with it? One option is to manage it like a golf course. At the other extreme, and much commoner, would be to give it over completely to natural processes. Yes, that requires redefining what we mean by the term “weed”. Or maybe we can manage our land as a mix of the two extremes–leave some lawn but also leave other areas where nature is allowed to take charge. We could intervene selectively, encouraging some species while removing others. Of course, whichever of the latter options you choose, there may be neighbors who sniff in disapproval. They likely would favor the first option which offers you hope that you can have that lush, deep green turf that the corporate purveyors of lawn equipment and chemicals hope you want. Environmental implications of this choice are up to you to determine or to ignore. The other choices are, to my mind and I hope some of yours, more interesting and wise in an ecological context. These thoughts are worth pursuing further, and I hope to engage you on them in the future. 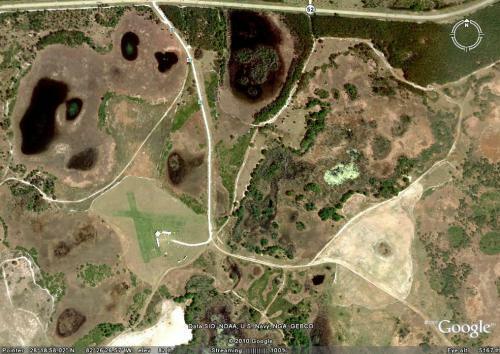 The satellite image (below) of Southwest Water Management District lands in Pasco County, Florida, reveals a wide range of ecosystems and surface features reflecting man’s varying influence. The land use types run the gamut from natural ponds (dark features) and adjacent cypress wetlands which although appearing natural, likely have been subject to disturbances of their hydrologic and nutrient cycles and quite possibly their animal and plant communities. Meanwhile the overmowed sandy soils, roads, and former grazing lands (light features) clearly reflect stripping away of soil organic matter and the virtual extirpation of natural biotic communities. Clearly, lawns, as typically managed in the United States, more resemble the highly disturbed end of the landscape gradient, although often much greener in the growing season as a result of irrigation and fertilizing. Nudging our yards along towards the less disturbed end of the gradient is not necessarily a major chore and can be approached in different ways. More about this later. Monarch butterflies are famous for their autumn migration over long distances from their extensive North American habitat to a small area in the mountains of central Mexico where they spend the winter in a dormant state called diapause. The following spring the great majority of butterflies undergoes a return flight to their North American habitat where they mate, lays eggs and die. Northern migration from Mexico may involve three generations before monarchs reach summering grounds in the northern United States and Canada. The eggs hatch producing caterpillars that rely entirely on milkweeds (Asclepius spp.) for food. As adults the butterflies sip nectar from flowers but are not dependent on milkweeds for this. In the fall, the new generation of butterflies makes the return journey. The butterflies undertake this amazing journey through the use of a Sun compass that relies on chemical circadian clocks situated in their antennae. Recent studies indicate that if ambient temperatures in the winter habitat are not cold enough as could happen with global warming, the wintering butterflies may not make the directional switch in their compass that is essential for northward migration. In addition, Oberhauser et al. suggest that global warming will make the Mexican forests too wet for Monarchs causing them to take a shorter route to the Gulf Coast. If so, the range shift can expose the butterflies to greater parasite infections. Studies have shown that non-migratory monarch populations in Florida have higher parasite loads than migratory populations. In one study of monarchs in Florida, over 70% were infected. Monarchs from the western US react similarly. In a study of 15,000 western monarchs, 8% of those taking the traditional route to Mexico were infected with the parasite, compared to an infection level about four times higher in monarchs which ended their migration in California. Apparently the long, arduous trip to Mexico that monarchs have historically taken every summer and fall, may have the advantage of screening out weaker, infected butterflies during migration while the more adaptive individuals reach the wintering grounds. However, in 2014, for the first time in history, monarchs did not return to large parts of their traditional winter habitat. In fact, they were found on only 1.65 acres of the 45 acres they historically occupied in Mexico, suggesting a serious collapse in population size. In 2015, the occupied wintering area increased slightly to 2.79 acres (Green Peace 2015). This modest increase in habitat used by wintering butterflies from 2014 to 2015 is, of course, encouraging but far too premature to conclude that the monarch has recovered. One reason suggested for the population crash that is independent of climate is the recent heavy application of herbicides in the U.S. to genetically-engineered crops designed to tolerate herbicide doses at levels high enough to eliminate wild plants including native milkweeds that sustain the monarchs. The milkweed-dependent butterflies are forced to expend more energy searching further afield for healthy milkweed plants on which to deposit their eggs. Adverse weather (year-to-year changes) on wintering or breeding grounds, habitat loss, which represents a more or less permanent loss, and as mentioned, parasites, also likely were involved in reducing overall butterfly survival. Butterfly counts in northern Michigan and Ontario show little decline suggesting that bulk of the population losses occurs further south including in the Gulf states. Flowers of Asclepias curassavica . Visible are the 5 reflexed petals (dark orange) and the top of the gynostegium which consists of the stamens (not visible) attached closely to the female unit (gynoecium). Also seen are part of an immature inflorescence, petals still unopened (left), and a developing inflorescence (right). As mentioned, a small proportion of the eastern North American monarch population is relatively sedentary, in that it remains in Florida (and to a more limited extent in other Gulf states) and goes no further to overwinter. Additionally, some migrating butterflies reach Florida but go no further. Besides higher temperatures that stimulate parasite increases, the butterflies also encounter the non-native Asclepius curassavica in central and southern Florida (and in southern Texas). This tropical species is quite attractive in flower and is widely sold by nurseries and also sometimes establishes wild populations. It also is attractive to local monarchs which lay eggs on the foliage as they would on native milkweeds. A ripe pod with seeds of A. curassavica . Seeds are outfitted with attached “silk” which aids wind-dispersal. In its Florida habitat, the tropical milkweed remains in leaf throughout the winter. Unfortunately this tends to tempt more monarchs to forgo migration and stay in Florida where winter temperatures can be higher than in traditional wintering grounds. There appears to be no convincing evidence that consuming tropical milkweed foliage adversely affects the butterflies beyond tempting them to modify their migratory habits and thereby incur higher parasite loads. A. curassavica is native to much of the Neotropics including Mexico where monarch caterpillars rely upon it. Warmer winter temperatures may permit the tropical milkweed to expand its distribution in the U.S. northward thereby tempting more adult monarchs to avoid the long-distance journey to Mexico and remain where parasite exposure is greater. COMPASS (Green Peace) spring 2016. Oberhauser, K.S, R.K. R. Nail and S. Altizer. 2009. Monarchs In A Changing World. Biology and Conservation of an Iconic Butterfly. Comstock Pub. Assoc. 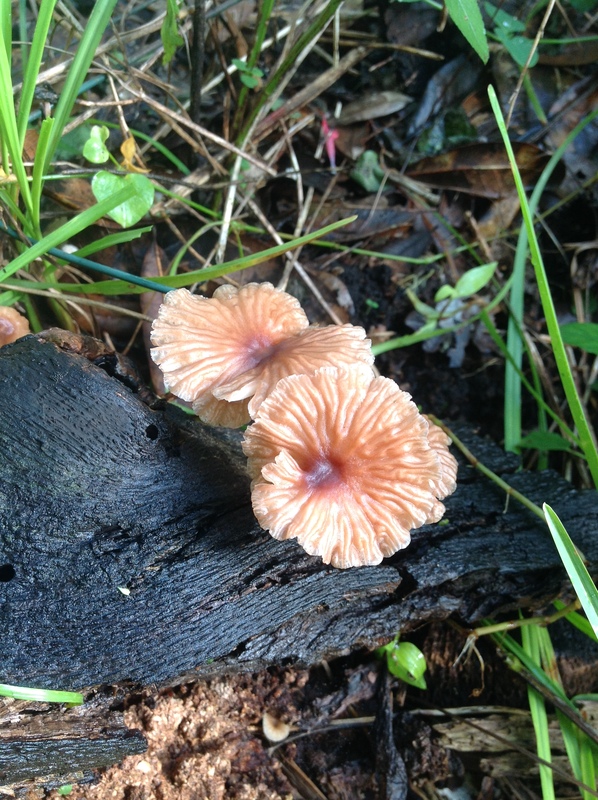 A few 2016 late summer-early fall yard fungi-Part I. During dry spells sandy, stony substrates can cause drought stress in plants unless their roots are deep in the soil or they possess other adaptations to dry conditions. Amazingly, there are fungi which thrive in dry, infertile habitats even though they lack roots. Here are a few that are easily overlooked but popped up in my yard in Sept-Oct of this year during what turns out to have been developing drought conditions. Pisolithus tinctorius is a variably colored upright species sometimes with a lobed or stalked appearance that appears in dry coarse soils. Its bizarre appearance has suggested the common name of ‘Dead Man’s Foot’. This specimen is nearly 15 cm high. All photographs are of fungi that appeared naturally in my yard. Mature fruiting body of Pisolithus with spore mass on top. 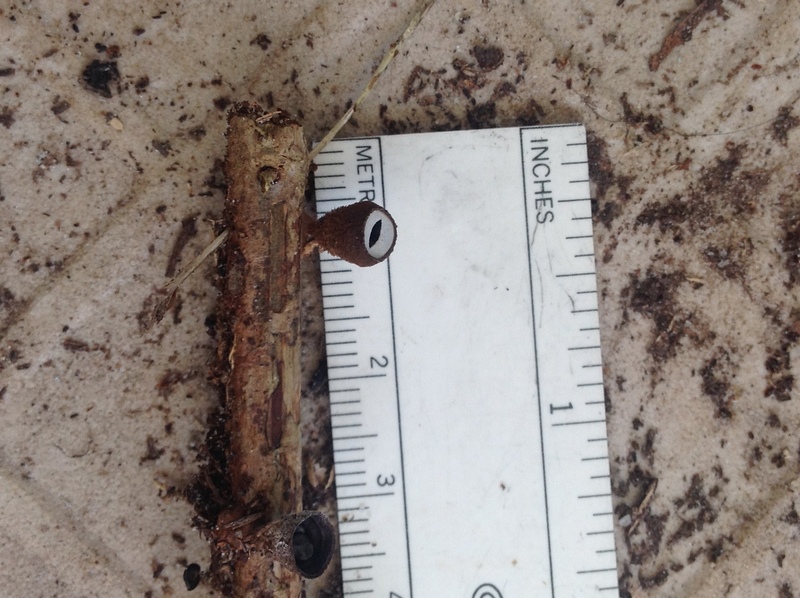 Note how the Pisolithus spore mass disintegrates when the fungus is disturbed (below). Spores released from mature Pisolithus fungus. In Pisolithus, the spores are initially contained within small, granular-like capsules (peridioles) that develop within the spore case. With maturation, the walls of the peridioles break down releasing the powdery spores. Peridioles are visible in this naturally split-open spore case with released spores visible at the topof the fungus. Fungi belonging to the genus Scleroderma are thick-skinned and form low stocky fruiting bodies that may be hard to discern when growing in stony soil. They resemble puffballs in shape but are much thicker and resistant to adverse conditions. Some species of Scleroderma release spores from an apical slit while in others the fruiting body splits open forming lobes that peel back exposing the spores. Initially the spores form a dense mass that separates after desiccation. A Scleroderma has formed an apical slit through which the spore mass will emerge. The specimen is about 5 cm along the long axis. Spore mass ejected through widened apical slit. 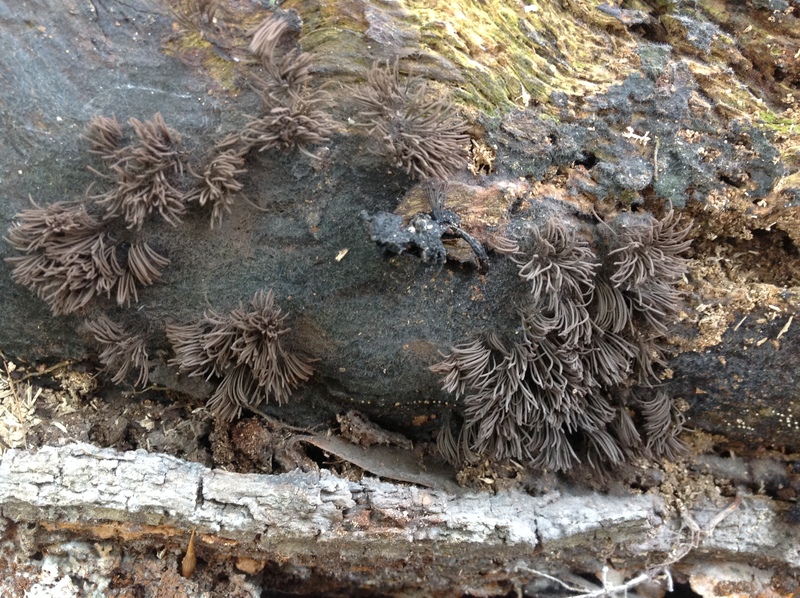 In this follow-up photograph (above), the same fungus is seen two days later with the spore mass ejected. In another species, spore-release is achieved by a natural peeling-back of the spore case. A S. geaster in which the spore case partially peeled back to form lobes thereby exposing the spore-bearing surface. The post-mature spore case of a Scleroderma in which the rind-like skin is opened. Most spores are released but some still adhere to the rays. This specimen may not belong to the same species as the prior one. Numerous black fruiting bodies of Daldinia mixed with lichens, both growing on a dead oak twig. Daldinia is a genus of tough saprotrophic species that colonize dead wood and persist (dead or alive) for long periods (likely months or more). The species shown here forms hard fruiting bodies about 0.5 cm in diameter covered in small pimple-like protrusions. It is unclear as to whether the fungi or the lichens first colonized the branch which fell to the ground already well colonized. Some Daldinia species are called ‘cramp balls’ and resemble pieces of charcoal. A related genus (Ditrype) forms a black crustose layer on larger (dead) branches that resembles dried tar or paint! Daldinia is classified as belonging to the Ascomycetes and is only distantly related to the Scleroderma and Pisolithus species discussed above. The latter two belong to the Basidiomycetes, the second major sub-divison of the Fungi. Two species of anoles are found in the southeastern U. S., the native green anole (Anolis caroliniensis) and the closely related but non-native brown anole (A. sagrei). The two species interact wherever they co-occur in the U. S. (mainly in Florida), with the brown anole typically outcompeting the green anole in the struggle for space and resources. Stuart et al investigated the extent of evolutionary divergence of the two species of anoles on islands off the east coast of central Florida. At the study site, A. carolinensis occupied all of the 11 islands studied while A. sagrei established populations on five of the study islands sometime between 1995 and 2010. After experimentally introducing brown anoles in 1995 onto islands that formerly held only green anoles, the scientists found that the green anoles moved to higher perches on shrubs and trees after appearance of the brown anole. In contrast, where only the green anole occurred, they occupied elevations ranging from the ground to the tops of trees. Note that the invaded and non-invaded islands did not differ in environmental characteristics important to anole perching or movement. The most interesting aspect of this study was that A. carolinensis developed larger toe pads with more adhesive scales in association with vertical displacement of chosen perches. The morphological change represented a fixed genetic adaptation that manifested after only 20 generations. These results show that evolutionary change in vertebrates can occur in short time scales particularly if competing species are closely related. Relatively few studies have produced evidence of ongoing evolutionary change in vertebrates as opposed to less complex organisms such as bacteria. To learn more about interactions between these two anole species, see the post “Anoles: Green and Brown and Spreading” under Invasives, elsewhere on this site. Stuart, Y. E., T. S. Campbell, P.A. Hohenlohe, R. G. Reynolds, L. J. Revell and J. B. Losos 2014. Rapid evolution of a native species following invasion by a congener. Science 346:463-466. Here are just a few plants consumed by mankind as a “stimulating beverage”. In this post, the focus is on plants containing caffeine and theobromine. Caffeine is an alkaloid found in over 60 species of vascular plants, and as we know, is an important ingredient of coffee, tea and other beverages. Chemical formula for caffeine, an alkaloid. The coffee beverage is derived from the roasted or baked seeds of two species of the coffee plant (Coffea arabica and C. canephora) of the family Rubiaceae. Tea is derived from the leaves of the tea plant (Camellia sinensis) of the family Theaceae, and chocolate is derived from seeds of a pod that springs directly from the trunk of the cacao tree (Theobroma cacao) of the Sterculiaceae. All three are woody shrubs or small trees commercially planted in the New and Old World Tropics and sub-tropics and all are descended from wild forest plants. Species of Coffea are native to Tropical Africa including the mountain forests of Ethiopia, Camellia sinensis to southeast Asia and cacao to tropical America. Note that the familiar camellia grown for its lovely flowers, is closely related to tea but of a different species of Camellia, C. japonica. The center of biological diversity of coffee is primarily centered in the highlands of Ethiopia where deforestration is reducing gene pool diversity. Today most coffee is grown in Brazil, Columbia, Vietnam and Indonesia but over a million Ethiopian farmers also grow coffee. Growers everywhere rely on only a few cultivars for their plantations risking the loss of genes important in conferring resistance to parasites, diseases and climate change. Now that a draft genome for coffee has been achieved (Zamir 2014), developing methods for improving cultivar genetic diversity is more likely to be realized. Coffee, tea and chocolate contain, among many other chemicals, alkaloids, which are essential to the flavor of the resultant beverages. Alkaloids are bitter, nitrogen-containing compounds found almost entirely in vascular plants. There are thousands of alkaloids, many (most?) toxic to insects, and many also exhibiting phytotoxic and anti-fungal properties. Many of these are also toxic to humans. (for more on alkaloids see the article entitled “Hold the Parsnips” under Plants elsewhere on this site). Caffeine (1,3,7-trimethylxanthine) is perhaps the best known alkaloid by virtue of its association with coffee and tea. In a sequence of biochemical steps, enzymes in coffee plants convert a precursor compound called xanthosine into caffeine. The caffeine content of coffee is determined by the blending of beans of C. arabica, which contain relatively little caffeine, with that of C. canephora (Robusto), which contains relatively more caffeine. As a brief aside, note that xanthosine is derived from the closely related compound, xanthine, and that xanthine can be found in meteorites. Meteorites of course, originate in outer space and many have collided with Earth. In 2011, analysis of a meteorite that landed in the Antarctic substantiated that the carbonaceous material such as xanthine that was found in the meteorite had to have been synthesized in outer space rather than just being a contaminant originating on Earth! A second alkaloid universally present in coffee is trigonelline which occurs at only marginally lower concentrations than caffeine, but it is much less stable and degrades at roasting temperatures. However, one of its breakdown products is a group of compounds called pyridines which are major contributors to the distinctive flavor and aroma of brewed coffee. (coffeechemistry.com). Another major category of compounds in coffee is oils of which there are hundreds (e.g., lipids and triglycerides) and which also are principal contributors to coffee’s flavor and aroma. Tea derives its flavor from caffeine, polyphenols and essential oils, the proportions of which vary with leaf age and method of processing picked leaves. Caffeine content of tea leaves can be up to three times that of C. arabica beans. One of the intermediate steps involved in the conversion of xanthosine to caffeine produces theobromine, the main alkaloid in chocolate. Theobromine, in turn, is the precursor of caffeine. Similar biochemical steps yield caffeine in both the cacao tree and in tea but different antecedent genes and enzymes are involved. There must be something beneficial (adaptive) to storing caffeine in tissues or it would not have been selected for in unrelated plants. One hypothesis is based on the observation that the caffeine in senescing Coffea leaves inhibits the germination of seeds of other species. Thus caffeine-containing plants gain an advantage in the competition for nutrients, light and water. Another adaptation relates to pollination. Caffeine in the coffee plant is not restricted to seeds but is found throughout the plant, even in the nectar secreted by the coffee plant’s flowers. It turns out that bees resemble humans in that they “respond positively” to the caffeine in nectar, seeking it out and choosing flowers with caffeine over flowers lacking it. For other animal species, however, caffeine is a toxin capable of causing sterilization. The intense bitterness of caffeine and its high concentration probably are sufficient to deter insects seeking to consume the fleshy tissue enclosing the coffee seed within the fruit. Chocolate is prepared from fermented cacao seeds of Theobroma cacao which are roasted and ground and often flavored with vanilla, sugar and sometimes fat. Besides T. cacao, the genus Theobroma includes 30 to 50 tropical American tree species that do not produce chocolate. Although Theobroma cacao is native to South America, almost half of the world’s commercial cocoa supply comes from a small area in west Africa, within 300 km of the coast in Ghana and the Ivory Coast. In these areas, based on some climate models, an average temperature rise of 2.3 C could occur by 2050. This warming would adversely affect the growth and respiration rates of Theobroma trees and effects could first appear as early as the year 2030 (Inter. Center for Trop Agric). However, other areas presently unsuitable for commercial chocolate production could, in response to the projected warming, become suitable for chocolate producers. The net effect of these shifts in cacao growing areas in coming decades is unclear. Theobromine and caffeine are closely related and co-occur in many plant species besides cacao, including, at relatively low concentrations, members of the citrus family (Rutaceae). Theobromine is less addictive but is a stronger heart stimulant and vasodilator than is caffeine. The theobromine content of chocolate is low enough that ordinarily, toxic effects are not a concern for humans but it is highly toxic to dogs and cats. Cacao beans contain caffeine at concentrations varying from 0.1 to 0.7% while fats (cocoa butter) comprise over ½ by weight of the seed. There are 30-40 seeds (“beans”) in a pod. The pods are hard and fibrous providing some protection from wildlife but pods can be opened by rodents and monkeys which are attracted to the sweet pulp surrounding the seeds. Getting past the pod still requires that the marauder resist the astringent tannins abundant in the pods and, of course, the bitter alkaloids. Caffeine also is an ingredient in forest trees of tropical West Africa belonging to the genus Cola of the Sterculiaceae and known as kola nut trees. The nut is the source of the caffeine used by humans as a stimulant and soft drink and as a treatment for asthma. Kola nuts contain about 2-3.5% caffeine and 1.0-2.5% theobromine and are still today chewed by many people in West Africa, presumably to enjoy the caffeine stimulation. The Cola genus consists of about 125 tree species of which two serve as the source of the kola nut- C. acuminata and C. nitida. Yet another caffeine-containing plant is mate’ (yerba mate) which is consumed widely in Latin America especially in Uruguay and Argentina and to a lesser extent, in Spain and Portugal. Mate contains less than 1% by weight of caffeine. To prepare, leaves of Ilex paraguariensis (Ilex is the genus to which the hollies of North America and Europe belong; see below) are ground to a powder and steeped in hot water. Interestingly, in common with tea and many other plants, mate contains polyphenol antioxidants ( e.g., chlorogenic acid) that are recognized as having anti-cancer properties. However, drinking mate at very high temperatures may increase the risk of esophageal cancer, as might the imbibing of very hot tea. Otherwise mate is not presently classified as a carcinogen and is believed to confer some cardiovascular benefits to consumers. How mate can be purchased in the U.S.
Guarana’ (Paullinia cupana) of the Sapindaceae is a robust tropical liana which yields an herbal tea made from its seeds that have been ground to a powder. Guarana’ seeds are high (3.6-5.8%, or 2-4% depending on source) in caffeine compared to coffee (about 2%). The plant, native to the Amazon Basin, also contains smaller amounts of theobromine (200-400ppm). Like the other caffeine-containing plants, its fruits and seeds are known to repel herbivores. Public domain art depicting Guarana’ shoots, leaves, flowers, fruits and seeds. Guarana’ tea is important in rituals of native peoples of South America and was already transported by 16th century explorers to Europe where it was soon consumed as a beverage. Currently, guarana’ is promoted as a dietary supplement that presumably boosts physical activity. Other species in the genus also are of interest. P. yoco , the bark and stem of which contains caffeine, is used by native peoples of Columbia and Ecuador in herbal medicines and to prepare a beverage. 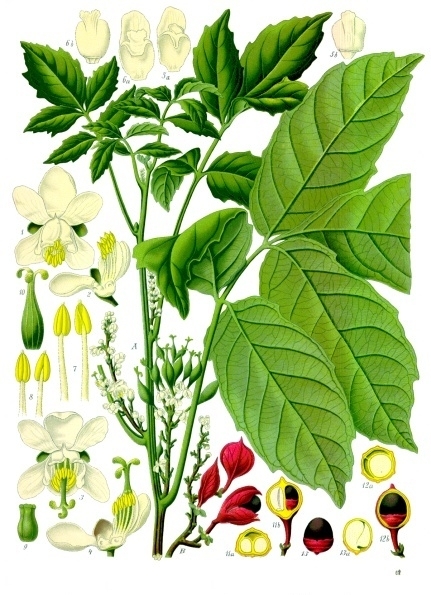 Two closely related species are very toxic-P. cururu of Central America and The Antilles and South America which produces a highly toxic sap that is used as an arrow poison by South American native peoples, and P. pinnata of South America and Africa, the stems of which are used to poison fish in pools and the roots and leaves of which are used in traditional medicines. Huito or Jagua, (Genipa americana of the Rubiaceae), a widespread small tree of the Caribbean and Latin America, contains “very high amounts of caffeine in its seeds (botanical-online.com)” but it’s mainly the fruit that is consumed. 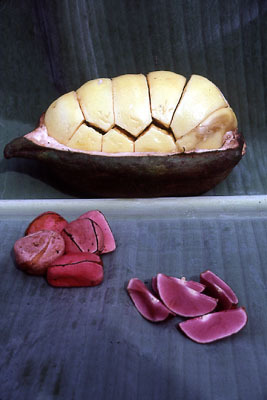 The fruit of this species is used in drinks and in various dessert dishes, in skin decoration and for certain ailments. Some level of caffeine is likely present in the fruit but this is unverified. The plant family Aquifoliaceae includes about 400 species, nearly all in the genus Ilex (holly). 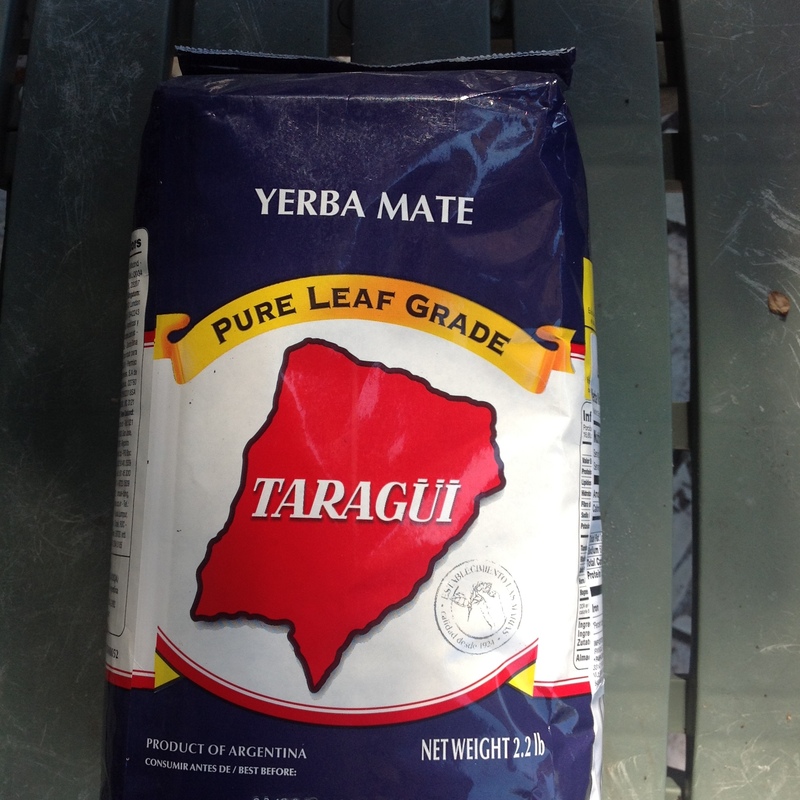 Besides yerba mate (above), other species in the genus have served as tea substitutes. Perhaps the most widely used in North America was Ilex vomitoria, the yaupon or cassina, a native shrub of the southern United States, especially common on sandy soils. The leaves of cassina have, according to Fernald et al. (1958), an “appreciable amount of caffeine, thus rendering…..them mildly stimulating”. Proper preparation involves kiln-drying of leaves followed by milling and steeping. Leaves of I. cassine, another holly of the southeastern US, also contains caffeine and reportedly makes a good tea. Other members of the genus, some of which lack caffeine, also are possible sources of a palatable tea. Fernald, M.L., A. C. Kinsey & R. C. Rollins 1958. Edible Wild Plants of Eastern North America. Harper & Bros. New York. Zamir, D. 2014. A wake-up call with coffee. Science 345:1124-1125. Following are a few species that appeared in my yard this September that might be missed by an observer who was focused mainly on the larger, fleshy mushrooms. It’s a heterogenous group, sharing only their inconspicuousness. All were encountered following an extended rainy period. Marasmius– a genus of small, fleshy mushrooms with many species distinguishable from the many other small, brownish or tannish, hard-to-identify mushrooms by their ability to recover from the desiccated state in the presence of water. A seemingly dead specimen can be placed in a cup of water and it will swell up to the fresh state within the hour. In doing so it is may be extending its ability to release spores over a longer period such as extends between rainy periods but this is not verified. I note, however, that sprayed water is sufficient to rehydrate the dried mushroom. A dried Marasmius mushroom formerly growing on a dead oak log. 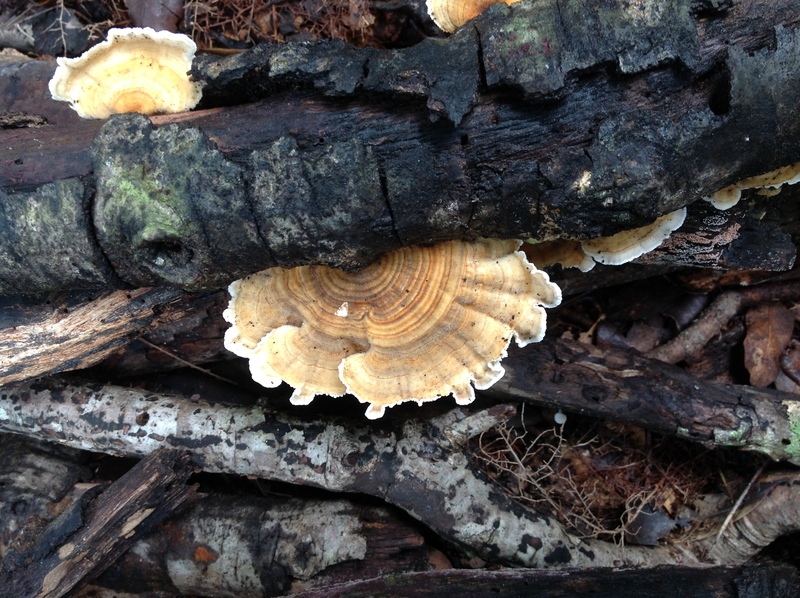 A pair of refreshed Maramius mushrooms on a dead oak log, one of which is depicted above in the dried state. 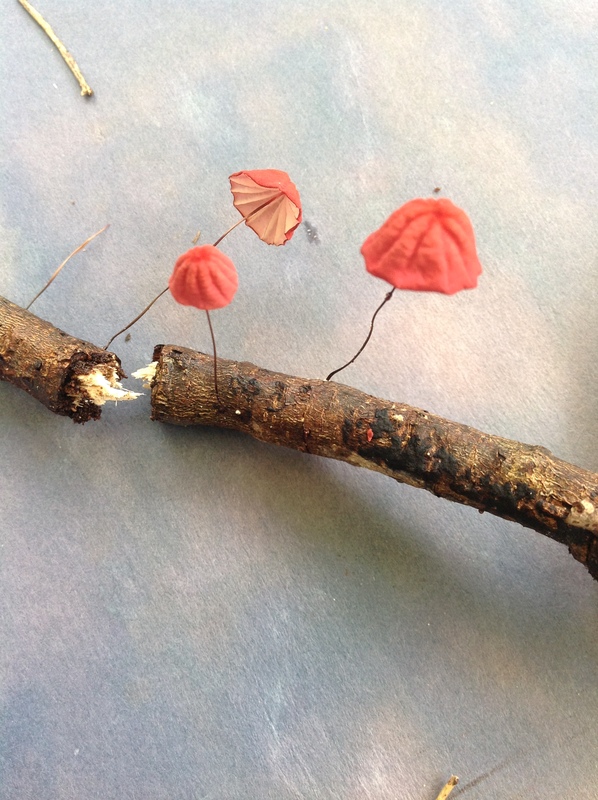 Marasmius haematocephalus, with a bright red cap, is saprophytic on twigs and leaves. Short-lived, this member of the Marasmius genus, based on my experience, appears not to revive after being watered. Note the well-separated lamellae on the underside and the thread-like stipe. A colorful member of the saprophytic Marasmius genus. Cyathus, the “bird’s nest fungus”, is a tiny saprophyte that grows on various substrates such as fallen twigs or herbaceous stems. 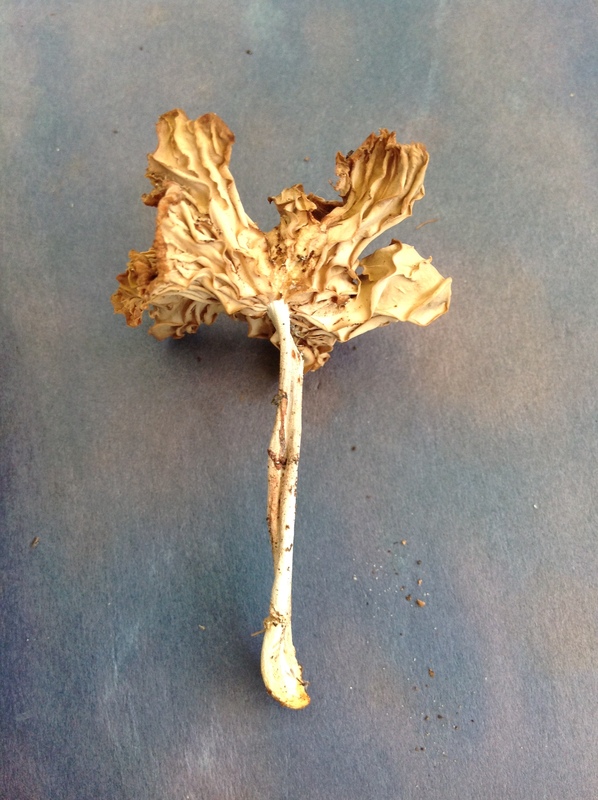 In the photo, the Cyathus fungi have established on a dead stem of the herbaceous Salvia (sage) which is 3 mm in width. I have also found it springing up in flower pots with organic matter on the surface. The fungus is shaped like an urn or nest which contains even smaller capsules (“eggs”) which contain spores. Interestingly, it is the capsule that is the dispersal unit rather than the spores as in mushrooms. The capsules have been shown to be washed out of the nest by raindrops only to land several or more feet away. The capsule then disintegrates, releasing the spores. An immature Cyathus fungus with a “lid” protecting the developing spore capsules. Mature Cyathus fungus with spore capsules. 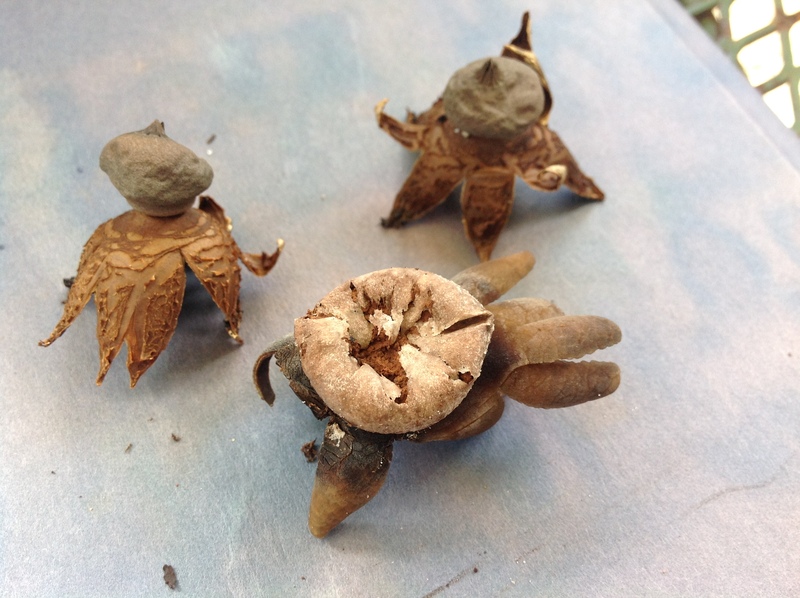 Geastrum, the earthstars are related to puffballs but are a bit more elaborate. At least two species are represented in the photographs. The outer layer of the fungus (the “skin”) splits open into segments that bend back, propping up the fungus above the substrate. An inner layer is revealed which soon develops an apical opening through which the abundant spores escape just like in puffballs. One species shown here has an apical “beak” and a narrowed base which gives it an urn-like appearance. Note that before the initial skin-splitting, the immature earthstar resembles nothing more than its cousin the puffball. Earthstars at two stages of maturation. 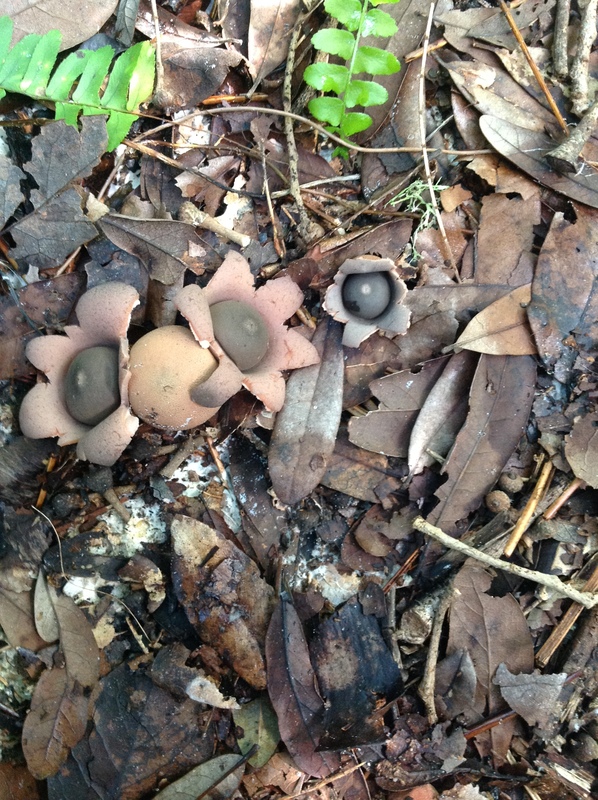 Two species of Geastrum probably matured before the September rains. Trametes versicolor– “turkey tail”, is one of the commonest of the shelf fungi that springs up on dead branchwood and tree trunks. Small compared to the large conks it’s related to, the upperside of this rather stiff or cardboard-like fungus features colorful bands similar to that of Stereum (discussed in an earlier post). But Trametes is more specialized as its underside is packed with dense pores (looking closely the pores are barely visible to the naked eye so a hand lens is better), the walls of which generate countless spores. New growth of Trametes pushing out at several places. Unknown crustose fungus- the photograph below shows a type of fungus that serves as an example of a large group that tend to be obscure and difficult to identify. Given the nature of the field, it would be quite unsurprising to find changes in nomenclature, discoveries of new species and genera, and new understanding of the basic functionality of this group! In crustose species, the spore-bearing surface forms no specific structures but hugs the surface of the woody substrate, discharging spores into the air. 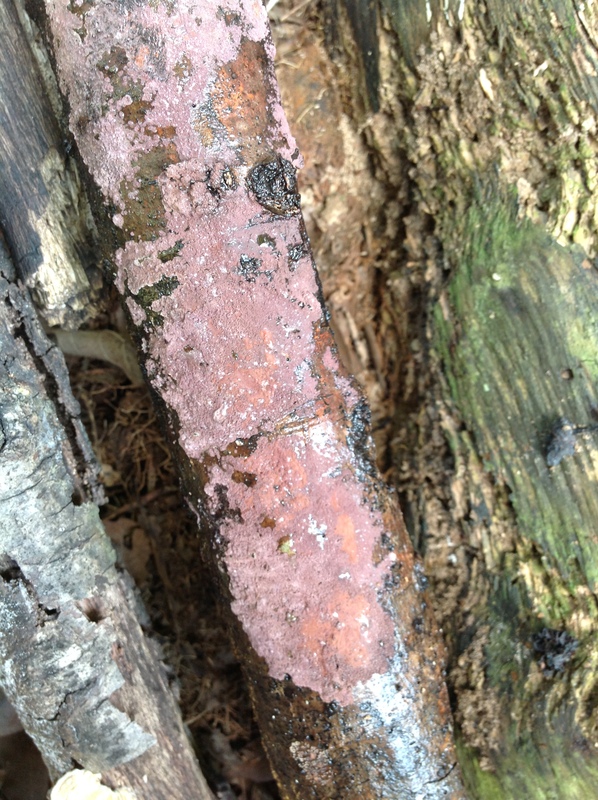 An unidentified crustose fungus colonizing a dead oak branch. Stemonitus- not a fungus! 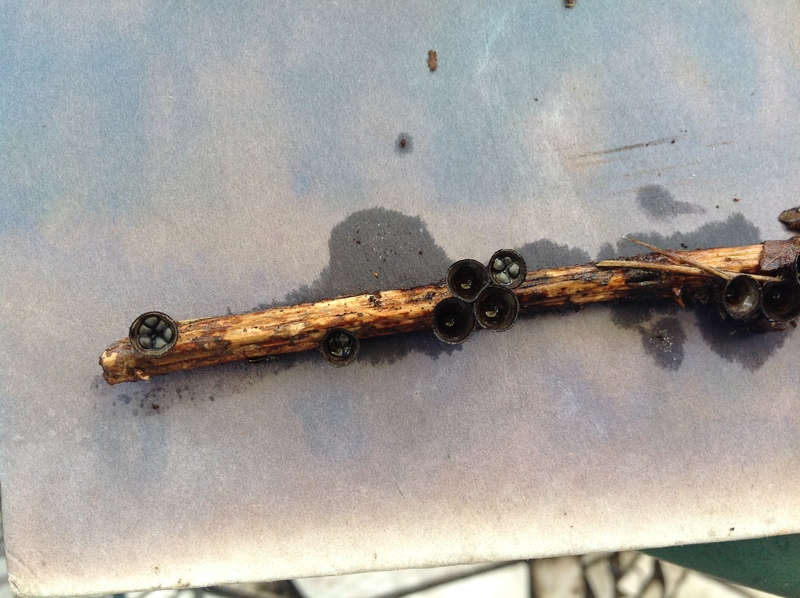 This slime mold was found growing on the same piece of wood as the Gymnopilus mushrooms (see previous post). The photograph shows the spore-bearing structures which will soon disintegrate, releasing spores. Slime molds resemble fungi in that the vegetative state is spent in dark, moist habitats, but differs in important ways. Most strikingly, the slime mold spends its vegetative days in a state of slow, flowing movement over the soil and leaf surface absorbing organic matter, nutients, and water as it goes! So many non-native animals including such notorious ones as the Starling, the Zebra Mussel, the awful members of the Rattus genus (gray rat and Norwegian rat) and the Burmese python, have become established in North America and are wreaking ecological and economic damage here that we perhaps don’t realize that the Americas (from Canada through South America) are a potent source of problem species across the oceans. Here are eight animal species native to North America that are valued (if not just ignored) on this side of the Atlantic Ocean, but regarded quite differently overseas. A reference for each one is provided to trigger further reading. 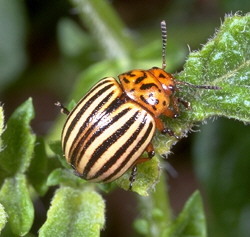 The Colorado Potato Beetle (Leptinotarsa decemlineata) first appeared in Europe in the 1870s and spread across the continent over the next 30 years. It is a major pest in European potato fields, especially in Germany. The beetle is native to southwestern North America, including Colorado and Mexico (full original range unsure) where one of its principal hosts is the buffalo-bur (Solanum rostratum), a prickly annual weed in the same genus as the potato. By 1840 the bug incorporated the potato into its range and spread rapidly out of its limited native distribution to become a major pest in central and eastern North America. It can be controlled for awhile with pesticides but quickly develops resistance as it had to DDT in the 1950s. The beetle got its start in Europe around military bases in France in the first World War, but then spread eastward. It is generally absent from Scandinavia, but widespread in potato-growing regions of Russia. The American Lobster (Homarus americanus) have been introduced live into Europe over the last several decades and wild individuals have been repeatedly observed in Norway, Great Britain and other northwestern European countries. More information is needed to clarify whether wild, reproducing populations are established in these countries. Interspecific hybrids involving the European lobster (H. gammarus) occur, and in France, over a thousand were released into open waters although their fate is unclear. The interloper is believed to transmit diseases lethal to the closely related European Lobster, including an epizootic shell disease which could threaten European Lobster fisheries. A bacterial disease lethal to Homarus spp and native to North America, has appeared in European lobsters in Norway and Great Britain. The American Lobster is larger, more aggressive, more fecund, and adapted to a wider habitat range than the European Lobster suggesting competitive inequalities that could lead to displacement of the native species. Stebbing, P, et al. 2012. Reports of American Lobsters, Homarus americanus (H. Milne Edwards 1837), in British waters. BioInvasions Records 1: 17-23. The North American Bullfrog (Rana catesbeiana) has been widely introduced outside its natural range over the past two centuries including to the western U. S., the Tropics, Europe and Asia. Introductions continue with several more occurring since the late 20th century. Often frogs are moved around within an occupied area rather than relying on overseas shipments. It is now widespread in Europe, expanding rapidly in southwestern France (where control efforts have been underway) and found in many stations in northern Italy where it got an early start but may be stabilizing its numbers. A major concern relative to American bullfrog invasions is that these animals aymptomatically carry the fungus responsible for chytridiomycosis, a lethal fungal disease that has spread to all continents harboring amphibians and has severely reduced or even exterminated amphibian populations worldwide. The impetus for this huge range extension of the frog is the flavorful meat of its hind legs! Unfortunately, where escaped, the bullfrog either eats or outcompetes a wide variety of other amphibians, reptiles, and fish and thus is capable of disrupting ecological communities and reducing species diversity in freshwater ecosystems. G. F. Ficetola et al., 2006. Pattern of distribution of the American bullfrog Rana catesbeiana in Europe. Biol. Invasions DOI 10.1007/s10530-006-9080-y. The Eastern Grey Squirrel (Sciurus carolinensis) of eastern North America is a major pest in the British Isles where it threatens the native red squirrel (S. vulgaris). The interloper competes vigorously with the red squirrel for food and carries a harmful squirrel pox disease, which is deadly to the native but asymptomatic in the grey squirrel carriers. The decline of the red squirrel in Britain has been described as “catastrophic” and largely attributable to the invader which is larger, more aggressive and able to eat a wider variety of nuts and seeds. To add to the impact, forest surveys show that the food trees preferred by the red squirrel (esp. the European larch) are steeply declining in England and Scotland and the species preferred by the interloper (Sitka spruce [another North American import], and planted deciduous tree stands) have increased in area. Grey squirrels were first introduced from the U. S. in the 19th century as pets or as curiosities for the rich. Note that S. vulgaris is not the same species as the North American red squirrel or chickaree (Tamiasciurus hudsonicus), a successful species not in decline. The Raccoon (Procyon lotor) of North America is an adaptable generalist that is at home in the wilderness and in our suburbs. They have charmed many a casual observer, but in the U. S., also act as a reservoir for rabies which can be transmitted to pets and to humans. In addition, although not native to the Old World, it is established throughout Europe, especially in Spain where there is a thriving population in the central area of the country. In eastern Europe, raccoons infected with rabies have been found and in Germany raccoons host a parasitic nematode that was thought to be confined to North America. Ecological impacts are expected given that predation of native fauna was verified in Spain. Garcia, J. T. et al. 2012. Recent invasion and status of the raccoon (Procyon lotor) in Spain. Biological Invasions 14:1305-1310. The American Mink ( Neovison vison= Mustela vison) is present in the wild in the British Isles, the Scandinavian and Baltic nations, China and Argentina, and several other countries. It is the most frequently farmed animal for its fur and escape from fur farms is the chief mechanism of dispersal in non-native lands. A voracious predator, it takes a variety of prey, from rabbits to crayfish, including some larger than itself. The American mink is apparently a contributor, in some places a major one, to the near-extinction in the United Kingdom of the water vole, a small native rodent. Studies have shown that in certain areas, the mink can significantly decrease populations of birds, rodents, amphibians and other mustelids (weasels and martins and the European mink). In comparison to it’s escaped congener, the European mink is smaller and less adaptable and therefore likely to be adversely affected in competitive situations. The freshwater Louisiana Crayfish (Procambarus clarkii), native to the southeastern U. S. and adjacent northern Mexico, was widely introduced on other continents largely for aquaculture to provide food. It has escaped into natural waterbodies, including in American states outside its natural range and widely in the temperate and tropical zones. It eats eggs and fry of native fish, mollusks and other crustaceans. In some places it outcompetes local crayfish and displaces them. It is also a carrier of a specialized fungus that is deadly to other crayfish. It was unwisely imported into Kenya and South Africa in the 1970s to reduce populations of parasite-harboring snails. Its numbers grew rapidly and its burrowing habit has damaged canals, dams and riverways. A snail-eating snail looking for prey. The Rosy Wolfsnail (Euglandina rosea), an obligate predator of snails, and native to the southeastern U.S. (North Carolina south to Florida and west to Texas), was introduced to the Indian and Pacific Ocean Islands (including Hawaii) in the 1950s to control the African Land Snail, another exotic species introduced earlier to the islands to please gardeners. Unfortunately, the Rosy Wolf Snail preferred the small native snails as its prey. It may now be found in Hong Kong, Taiwan, the Solomon Is., Guam and French Polynesia, as well as India and North Borneo. It is a likely cause of, or at least a contributor to, the extinction of over 130 species of snails native to the oceanic islands it has invaded. If the prey are small enough the wolfsnail consumes them whole including the shell! If we think of algae at all, we may envision green over-fertilized ponds or the kelp forests of the Pacific coast. I didn’t have to go any further than my yard to see that that’s too narrow a view. Observe the photograph below. The leaves are those of Chrysophyllum oliviforme or satinleaf, a small tree native to Belize, the Greater Antilles, the Bahamas, and south Florida. It is distinguished by foliage that is dark green and glossy above and a lustrous, reddish-brown below. The leaves in the photograph are host to a filamentous green algae of the genus Cephaleuros (perhaps the widespread C. virescens), an epiphytic (or parasitic) green algae that forms small colonies (ca 1-2 cm in diameter) on leaf surfaces. Sometimes called green scurf or red rust, especially in the tropical nursery trade, it is one of the few algae parasitic on higher plants. 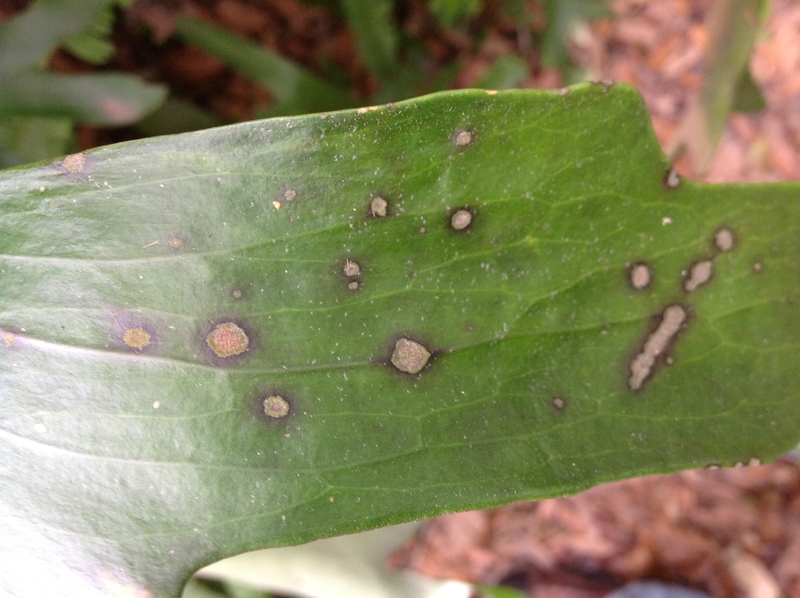 Colonies of C. virescens develop in the leaf sub-cuticle but don’t invade living cells. The genus Cephaleuros is found widely throughout the humid Neotropics and apparently is native there and perhaps in south Florida. As this tree originated in Homestead Florida, it is probable that the algae did as well. 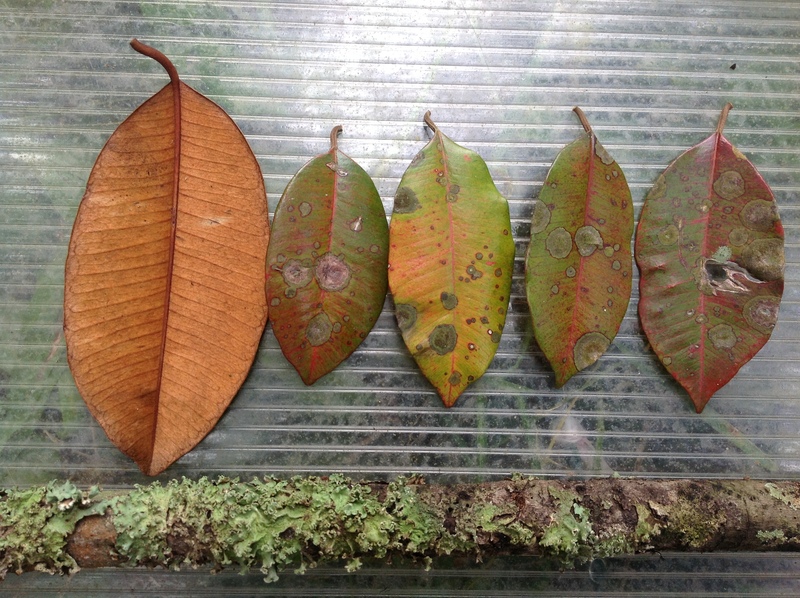 Five Chrysophyllum leaves, the left one with undersides visible, the others showing varying leaf pigmentation and algal colonization. Enlarged view of a senescing Chrysophyllum leaf heavily colonized by Cephaleuros algae. Enlarged view of asexual reproductive structures of Cephaleuros. The genus Cephaleuros is a member of a family (Trentepohliaceae) of six genera, an exceptional group that, unlike the great majority of green algae which are aquatic, occurs only on subaerial substrates. These substrates include, depending on genus, soils, rocks, buildings, bark, leaves, plant stems and fruit. The genus Cephaleuros is a strict epiphyte. Most other genera in the family may be found on leaves but in suitable conditions, also on other solid surfaces. Some species can damage human structures- members of the family are among the agents responsible for biodeterioration of concrete buildings, as reported in Spain, England and Scotland. One genus, Stomatochroon, is even more specialized than Cephaleuros- it is found only in the air spaces within leaves, and around the stomata (surface leaf pores through which gases are exchanged), of tropical plants. In my satinleaf tree,the colonies apparently don’t penetrate very far into the leaf and consequently are not visible on leaf undersides. Under nursery conditions, however, more serious infections may develop. 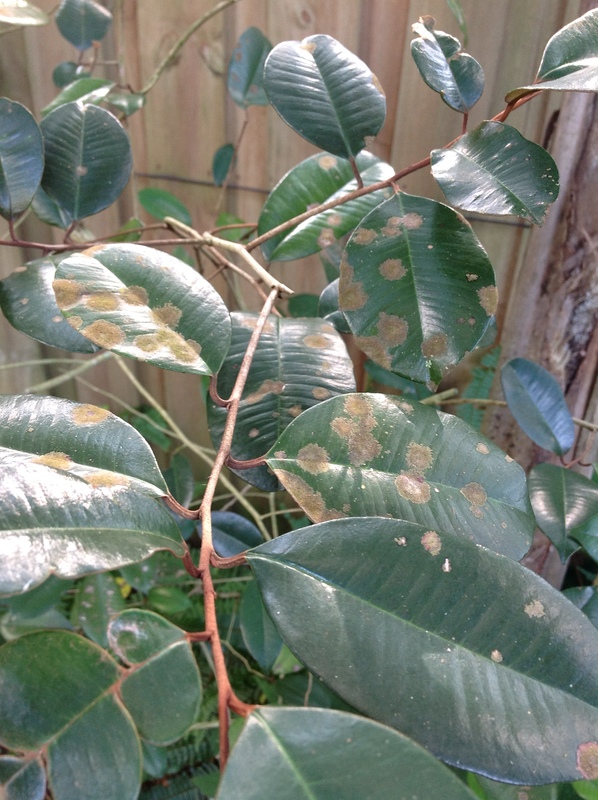 In fact, economically important species like tea (Camellia japonica, evergreen magnolia (Magnolia grandifolia), and guava Psidium guajava develop leaf lesions, and the guava fruit damage, to the extent that some nurseries apply copper-based herbicides and modify cultivation practices to control the algae. Poor nutrition, wet soils and high humidities are predisposing factors. In many cases, however, C. virescens is considered a minor or trivial problem while the more serious injury is caused by another species- C. parasiticus (Nelson 2008). Distinguishing the two is difficult but C. virescens is described as invading only the sub-cuticular layer while C. parasiticus penetrates the interior tissues of host foliage. In Gulf Coast area nurseries of the U.S., Cephaleuros is recorded on 287 vascular plant species and cultivars, including 80 susceptible to stem infections. In Florida, twigs and limbs of carambola (Averrhoa carambola) trees are attacked by Cephaleuros. It is also common on avocado, especially on low-hanging branches. 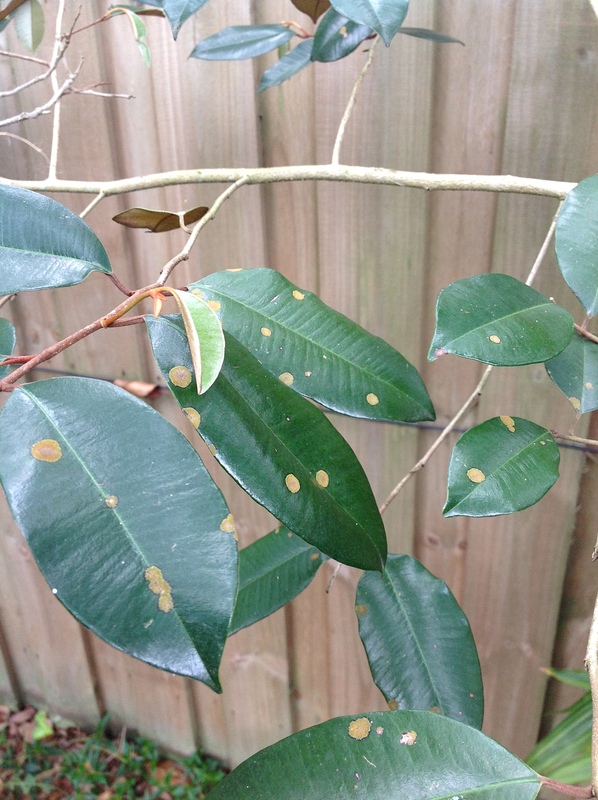 The leaf spots are often seen and reported by homeowners but the effect on avocado yield is usually insignificant. 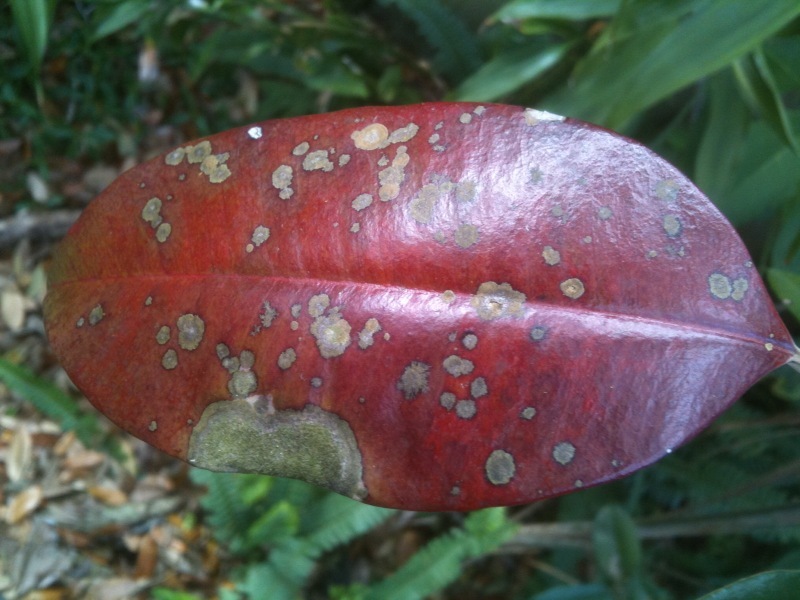 In my yard, the colonies occur also on one other species- a large staghorn fern (Platycerium bifurcatum) growing adjacent to the infected satinleaf (see photo). Otherwise there are no other plants (including three other satinleaf trees growing about 8 meters away) that host Cephaleuros in the yard. Epiphytic algal colonies on Platycerium, the staghorn fern. Interestingly, C. virescens can combine with certain fungi (e.g, the genus Strigula) to form epiphyllic (growing on leaf surfaces) lichens. It starts with an algal thallus being colonized by fungal spores. On many colonized leaves, both the lichen and algae occur. The lichens appear as grey-white crusts 1-10 mm in diameter on upper leaf surfaces. I have been unable to conclude that any of the epiphyllic growth on satinleaf in the yard is lichen in nature, although what could be small epiphyllic lichens do appear on other plants that lack algal colonies. More on this later. www.freshfromflorida.com : T.S.Schubert, 1981. Plant Pathology Circular No. 227. Strigula Fries, The Plant Parasitic Lichen. ctahr.hawaii.edu/oc/freepubs/pdf/PD-43.pdf : S.C. Nelson 2008. 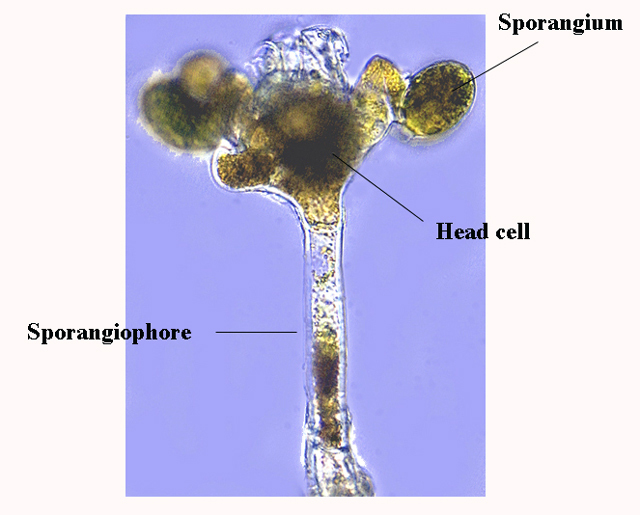 Cephaleuros species, the plant-parasitic green algae. (Cooperative Extension Service, Univ. of Hawaii, Manoa. 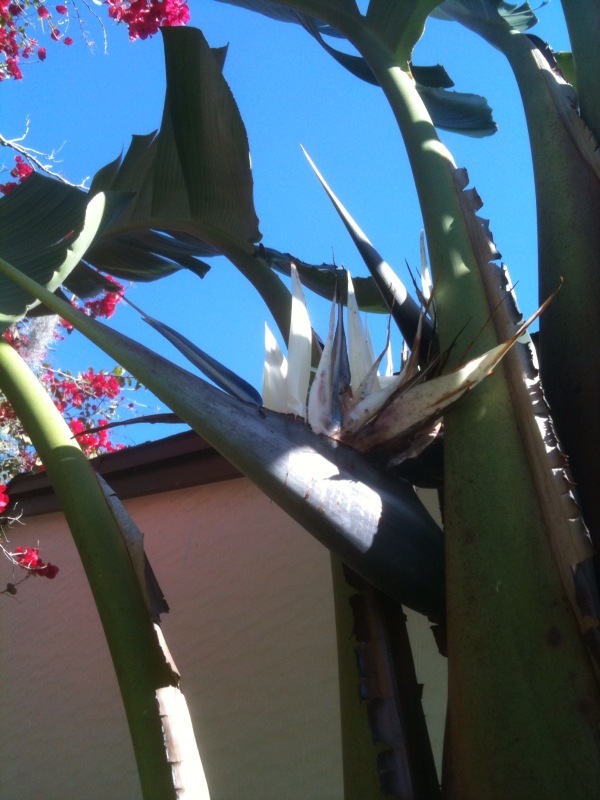 Strelitzia nicolai, the white bird-of-paradise “tree “ reaches 20’ (6 meters) in height in Florida but even higher in its native habitat- coastal forests and dune thickets of eastern South Africa. 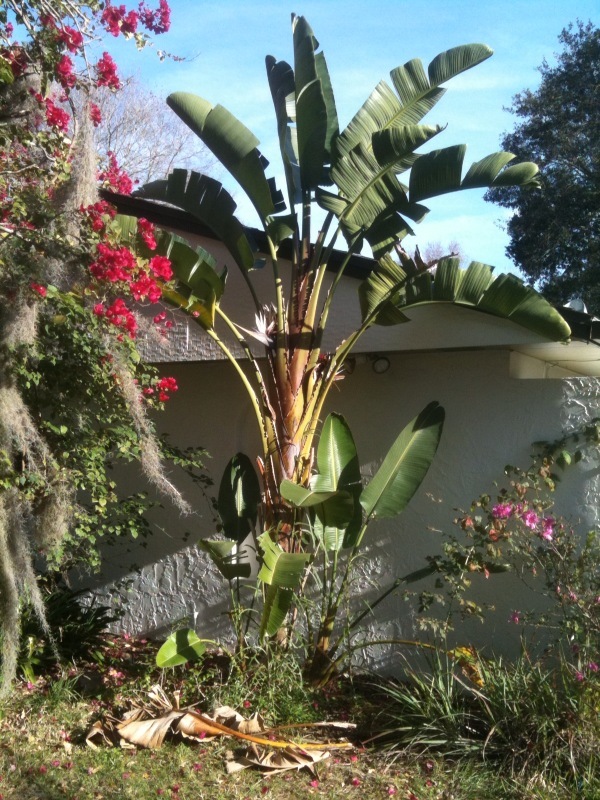 Based on local (central Florida) observations, the species can be grown where winter temperatures do not drop below around 26 F. (leaves will be killed), although even temperatures just below freezing will damage the leaves unless the plant is in a protected location. S. nicolai is a spectacular landscape plant capable of forming clumps of stems with leaves 8 feet long. It is considered an herb rather than a tree because of the paucity of ligneous fibers in its stem, which is comprised of overlapping, tightly packed leaf sheaths similar to the banana. When mature the plant forms a large basal caudex that is sometimes considered as semi-ligneous. Another species in the genus is the better known, smaller orange bird of paradise (S. reginae) which is more cold sensitive, and therefore restricted to southern Florida, California and Hawaii in the United States. The Strelitzia “boat” seen from below. 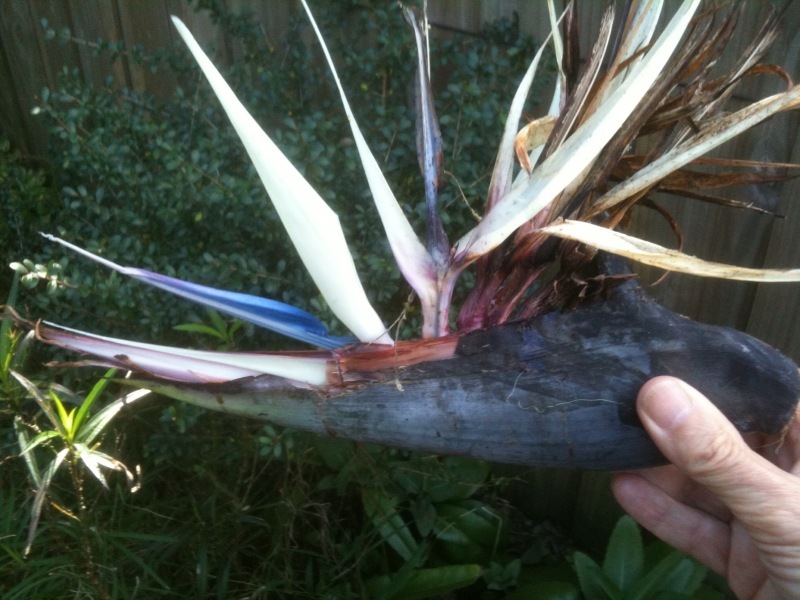 The bird-of-paradise name refers to the flowering structures (inflorescences) which emerge from a large, thick boat-shaped bract. The bract is initially closed but then opens along the top providing space for the emergence of highly modified bisexual flowers . A series of six to eight flowers sequentially emerges from the bract. Each flower consists of 3 petals and 3 sepals, one of the former being conspicuously blue and arrow-shaped. The other petals and one of the sepals are white and relatively large . The remaining sepals are concealed within the large bract and therefore are not visible without cutting it away. The vertically oriented flower is mature. A younger flower is to the left. The blue arrow-shaped petal holds within its elongated fold the sexual structures. As it ages, the flower and its blue petal arc upward, becoming vertical relative to the horizontal bract. On the 3rd day the flower, if unpollinated, dies. Within 48 hr, the next flower emerges from the bract, and so on for each flower until the last one has emerged. When mature the blue petal stands erect and the female structure (a thin, 3-part stigma about 4 cm long attached to a style over 9 cm long), projects beyond the tip of the petal. The stigma has a sticky surface, perfect for catching and holding pollen grains. Three stamens have been pulled out from the mature flower to the left. Note pollen on anthers and aging flowers with dried nectar on to the right. The male parts ( five linear, pollen- producing anthers attached to very narrow filaments), are entirely contained within the blue petal, but positioned just inside the petal’s opening. In the photo above, several of the stamens have been pulled out of the blue petal. Pollen can be seen on the narrow anthers. Manually separating the lobes of the blue petal reveals that the anthers release pollen within the petal , although some pollen also appears on the exterior of the petal (photo below). Pollen has accumulated naturally on the exterior of the blue petal. A surprising amount of clear liquid (presumably nectar) collects where the bases of the petals and sepals overlap to form a cup within the large bract. In some cases there’s enough liquid to overflow the bract and stream down its exterior. The large volume of liquid cannot be explained by precipitation because there have been no recent rains. This liquid was very attractive to paper wasps, honeybees and flies. However I was unable to detect a sugary taste to the nectar such as is found in nectar from honeysuckles and other plants. Possibly the insect visitors have more proficient sugar receptors than I have. Sugar concentrations vary widely in plants and may be well under 10% (Nicholson and Thornburg). But amino acids, lipids and other organic compounds occur in nectar and these substances might explain the eagerness of the insect visitors. The wasps and bees were competing vigorously for access to the nectar with the wasps attacking the bees to chase them away. It did not appear that the insect visitors were collecting or feeding on pollen and the bees lacked pollen in their pollen baskets. 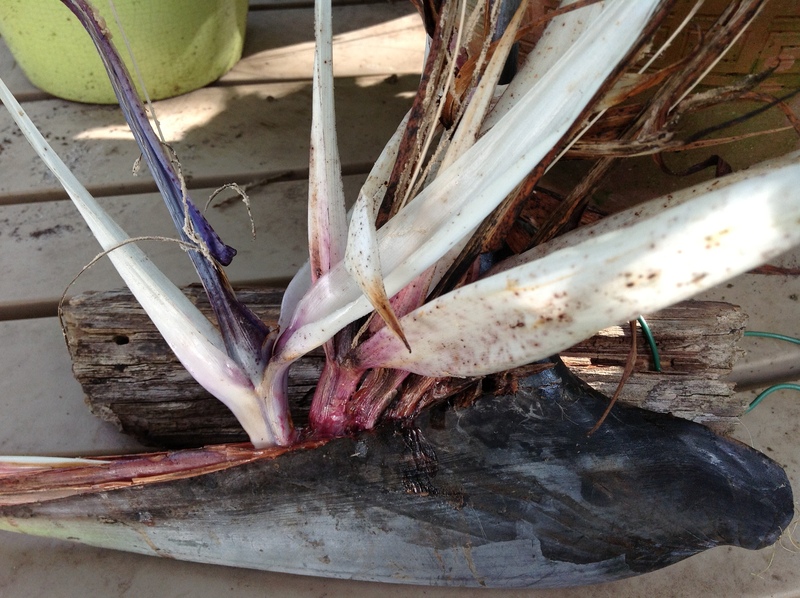 Thus these visitors were not serving as vectors for transferring pollen to Strelitzia stigmas. 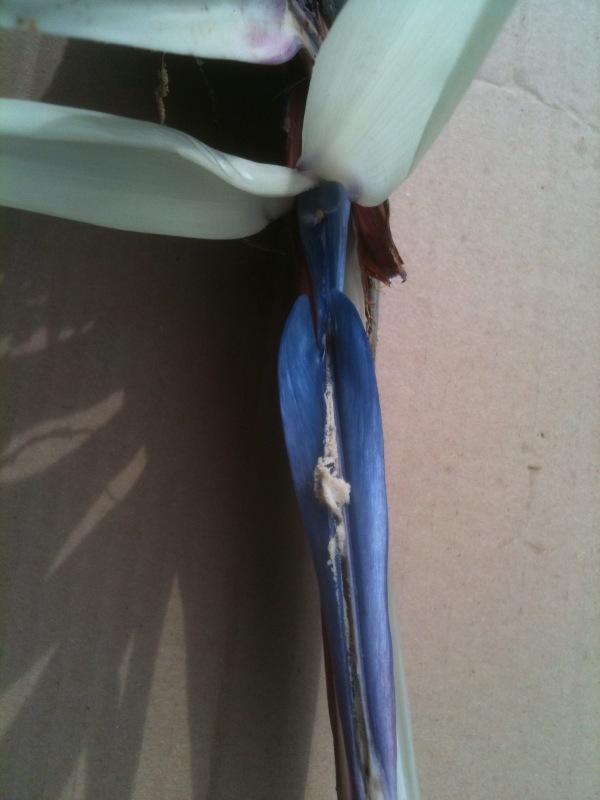 Despite the presence of several other Strelitzias in the neighborhood, there appeared to be no fruit or seed development in our Strelitzia (in this or in prior years) as one would expect in the absence of cross-pollination. In Africa, Strelitzias are pollinated by sunbirds- small, colorful, long-billed birds belonging to the Nectarinidae family (80 species in 15 genera. As the family name implies, sunbirds take mostly nectar besides feeding insects and spiders to their young. Sunbirds have some habits similar to those of hummingbirds, and, in fact, convergent evolution between the New World hummingbirds and sunbirds has been suggested. Both groups access flowers to consume nectar. One difference is that hummingbirds hover while sunbirds must perch in order to take nectar. In a study of the pollination of S. nicolai by four species of sunbirds in South Africa, Frost and Frost (1981) found that the birds cued to the angle made between the mature flower and the bract as an indication of nectar flow rates. The sunbirds perched such that pollen was transferred to the stigma via the bird’s feet- a very different approach than hummingbirds! Seed set was high indicating the efficacy of sunbirds as pollinators. Other species visited S. nicolai flowers (bushbabies, monkeys and insects) but none were significant pollinators. The pollination of Strelitzias by hummingbirds in central Florida would run into seasonality problems even if there were no other limits. S. nicolai flowers in winter months when hummingbirds are in their Central American wintering grounds. There may be a better opportunity to evaluate pollination in southern Florida where some Ruby-throated Hummingbirds winter or in California where several species of wintering hummingbirds and flowering Strelitzias may co-occur. M. charantia: mature fruits with aril-covered seeds, flower and foliage. soft red aril (further discussed below). Botanically similar or identical to the balsam pear is the “bitter melon” or “bitter gourd” of Asian cuisine. 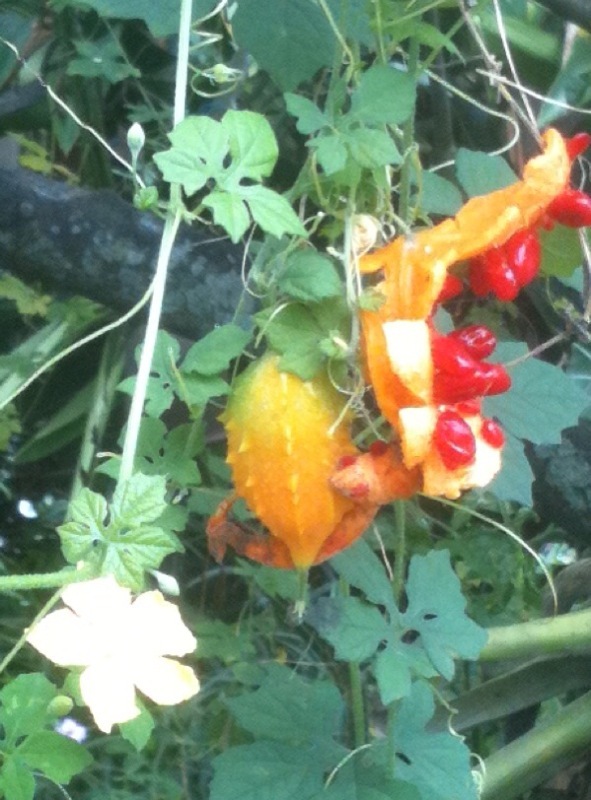 It also is classified as Momordica charantia but its fruits (the only part of the plant ordinarily to be seen outside of its native habitat) differ markedly from those of the balsam pear. They are much larger, some approaching a foot in length. Widely available in Chinese, Indian, and other speciality markets, the bitter melon is consumed by humans but only in the green, immature state. If allowed to ripen, the bitter melon like the balsam pear, becomes toxic to humans and to small animals. 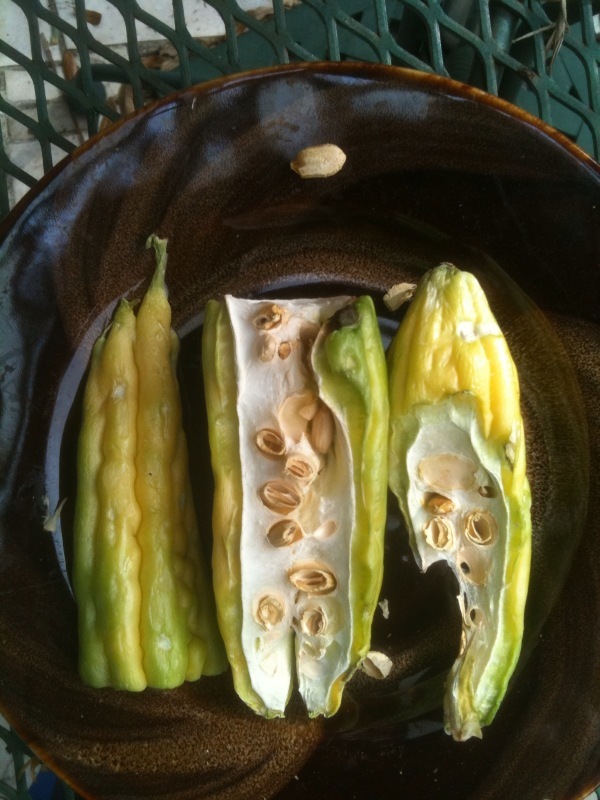 Severe diarrhea and vomiting are reported to occur in humans who eat the ripe fruit and seeds of M. charantia. The ripe fruits in small amounts also have been used to induce abortion. The large size of the bitter melon may be the result of artificial selection, the term used by Charles Darwin to describe the preference of humans for certain traits when conducting plant and animal breeding. Artificial selection, continued over long time periods can lead to genetic change within species of plants and animals that fixes traits desired by humans. Continuing selective breeding over many generations can produce offspring very different from their ancestors, and commonly, but not universally, varieties selected artificially lose their ability to survive without human help. Breeds of dogs (compare wolves, Great Danes and Chihuahuas!) and cattle, as well as corn, tomatoes and other fruits are examples. It’s not surprising, then, that the bitter melon is not reported as growing wild as is the balsam pear. However, I am unaware of any data that would clarify the genetic differences between the wild and the domesticated M. charantia. The photo shows half a bitter melon, 12 cm in length sliced in cross-section, then along its length. The left piece shows the exterior. The aforementioned aril is a fleshy appendage to the seed that usually envelops the seed and is brightly colored. It is not part of the seed but usually originates from the stalk to which the seed is connected. Animals are attracted to arils and often eat the enclosed seeds and in some cases the aril as well. It thus seems likely that the aril serves as an adaptation selected to increase the effectiveness of seed dispersal. I have repeatedly observed Northern Cardinals pluck aril-covered seeds from opened M. charantia fruits and then carefully strip off the aril with their beaks and consume the seeds. Only a few plants produce arils. Other species with arils include the yew (Taxus canadensis of North America, and a related species in Europe)- a conifer in which the cone is reduced to a single seed surrounded by a modified scale that becomes a soft, red aril edible by humans. The seed (and other parts) of the yew are poisonous to humans but the seed is consumed and dispersed by birds. 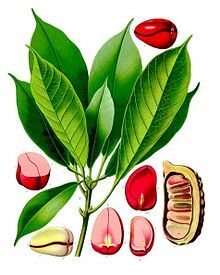 The aril of the nutmeg seed which is ground up for spice is called mace. The pomegranate not only produces an edible aril but this juicy covering is the part of the plant sought by humans although the seed also is edible. Italian oil group Eni is joining forces with shipbuilder Fincantieri, power grid group Terna and state lender CDP to develop wave power stations.